Pt Mollie: How was it climbing Kilimanjaro? 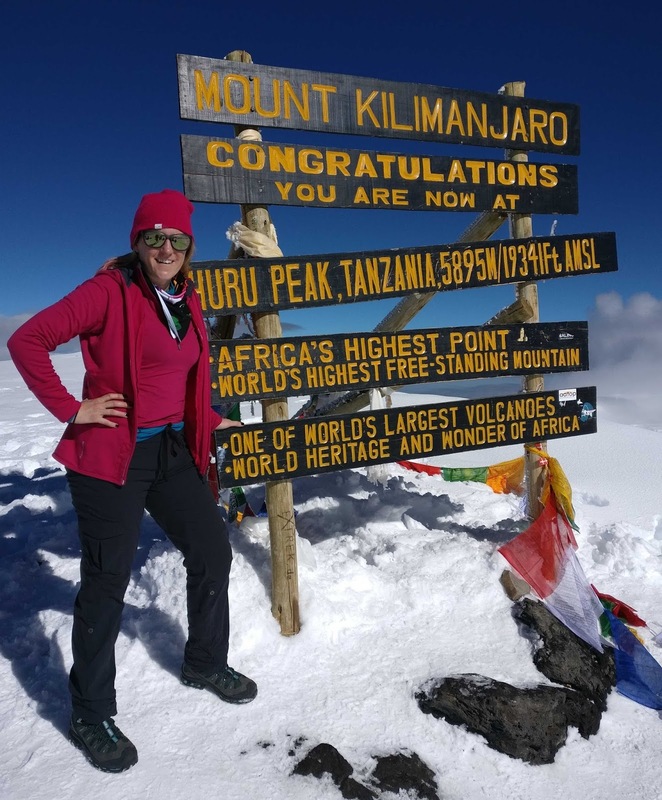 How was it climbing Kilimanjaro? Please note I have 5 layers on top and 3 on the bottom here. The question I have been asked most in the last few weeks has been 'how was it?' And I usually sum it up in one word- hard. It was honestly the hardest thing I have ever done. Harder than marathon training. Harder than open water swimming. Harder than hot yoga. The persistent physical demand for seven days, being constantly breathless due to the altitude, overcoming my fear/incompetence of peeing outside, sharing a small tent in the cold and rain, eating food I don't normally have, not having Diet Coke. All of these factors could have been the ultimate formula for a perfect storm. But luckily, it wasn't. Everyone who made the trip up the mountain. Asante! 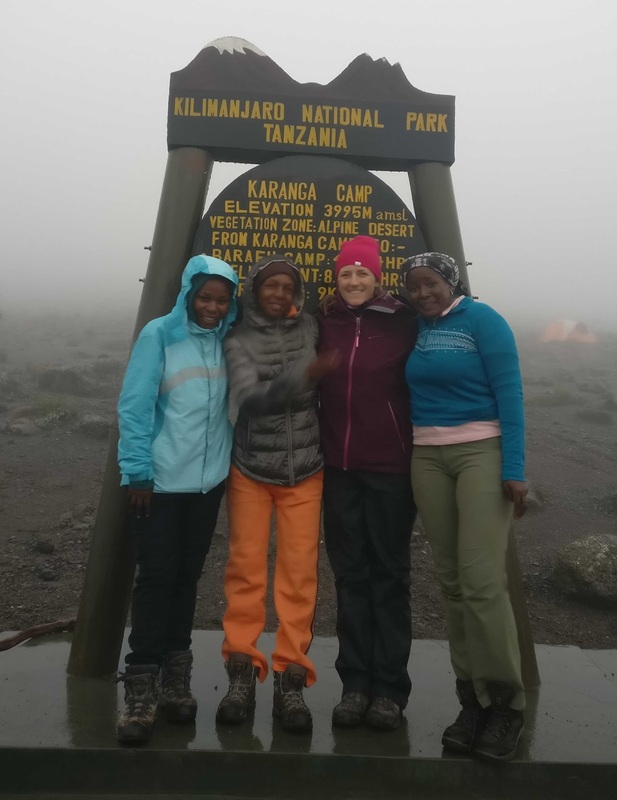 The easy part was forming friendships with the other women on the trip and crew of Eco-Africa Climbing. A typical day would start at 6 or 7am for washing from a shallow basin and getting dressed and packed. Thirty minutes later, porridge and hot drinks would be served in the mess tent. All meals included a liquid course to keep us hydrated as we were supposed to br drinking three to four liters of water a day. 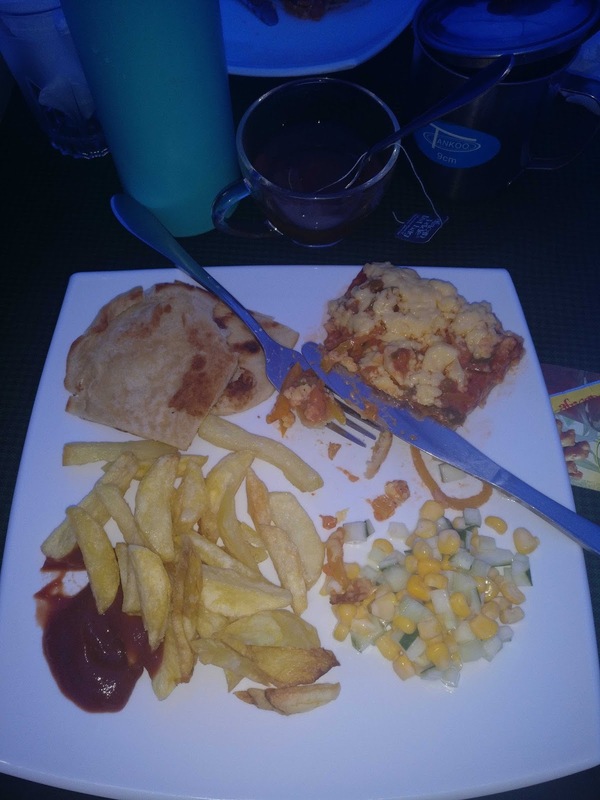 The next course would be omelettes and a carb- toast, chapati, or pancakes/crepes. Plus fresh fruit and Nutella. Initially, we were given sausages or another meat but two of the six women were vegetarian. As we climbed higher, I found my appetite waning. Certain smells would turn my stomach and I started to have tummy troubles throughout the day and night. I tried to avoid dairy and added water purifying tablets to my water (thank Victoria!) to see if either of these would help. This is a typical biological response to altitude plus I was on an antibiotic for malaria prevention. But I felt horrible about how much food we were leaving on the table after every meal. Luckily,the company owner told us that any food left would be shared with the tour guides and crew. They also were fed the local rice dish called pilao with a side portion of meat. Hot cocoa, pizza, and french fries. Best meal ever. We didn't have too many lunches as we were usually out hiking five to six hours a day. We did have lunch at the top of Lava Tower as part of our acclimation process (It was a winter wonderland up there, so it was nice to be inside the tent eating hot food.). About 4pm if we didn't have lunch, we would have fresh popcorn, shortbread biscuits, and tea. It was a time to catch up with the other women as we would usually split into 2-3 different groups due to differences in pace. I would take it easy as we had most of the day to make it to our next destination. Why not enjoy the view along the way? After tea, you had free time to nap, journal, or keep chatting away. We were on the cusp of the rainy season start so it was usually too cold and/or too rainy to sit outside or explore the campgrounds. I usually opted for a nap. Sleeping at altitude is tricky and when you add in sleeping at a slant and trying not to roll over your tentmate, you end up sleeping pretty light. About 6 or 6:30pm, hot water would be available for washing and 30 min later, hot drinks and vegetable soup was available. Each day was a different soup and they were all delicious! Our cook, Elia, was amazing. The next course was usually two different types of meat, rice or pasta, a sauce to go on the carbs, and a 'salad' of some sort (corn and cucumber with mayonnaise dressing, coleslaw, etc). After one of the women on our tour had to be rescued, we were down to three meat eaters. I would have happily been vegetarian the entire time and will remember that for the next time. I highly recommend booking a tour that includes a private toilet. The smell isn't bad and you can sit down. Somewhere between 8-9pm, we would start to get ready for bed. Teeth brushing, a stop at our private toilet, gazing up at the stars if it wasn't overcast, and then journaling if I hadn't yet. My memory for specific details isn't great, so I wanted to make sure that I wrote down anything special that happened that day. My notes mostly consist of how long and far we hiked and how many time I used my SheWee. Some days we were really chatty along the trail while others we were lost in our thoughts and trying not to fall over slippery rocks. Our conversations on the trial ranged from learning Swahili (which some of the crew thought was odd), to finding a song who's tempo was the same as our walking pace, to blogging tips, to how we met our partners. Of course, women can be chattier than men but we also got to know a bit about our guides, Maru, Nasri and Mussa. 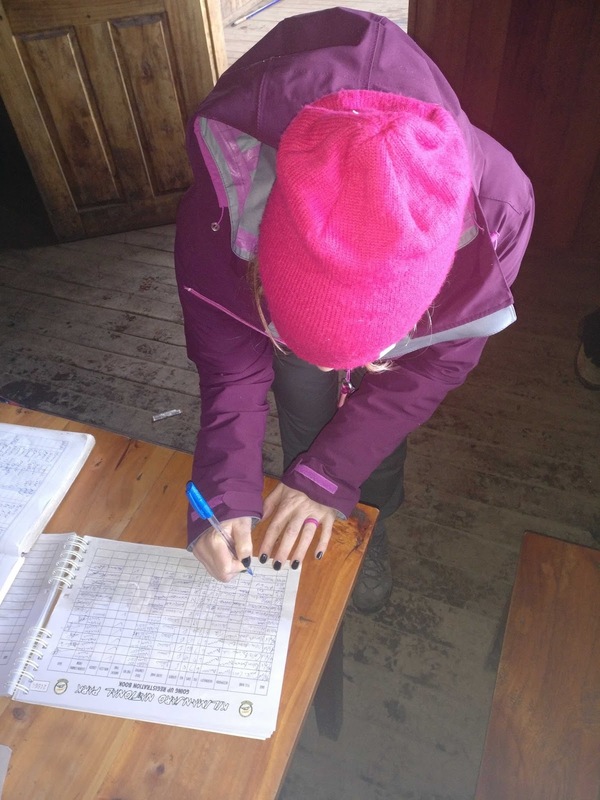 Each time we reached camp, we had to sign the official log and then we would get a photo or two at the sign. Sometimes the sun was out for these photos. Other times it was raining or snowing. We were all smiling by the time we got to camp, even if the hiking was tough. 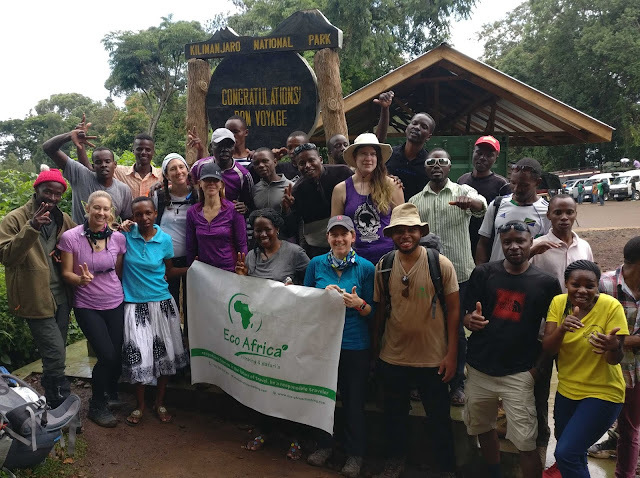 The first day we started at Machame Gate, which provided us with fairly kept trails. (Note that every day when we started hiking, we immediately were walking uphill. Kili doesn't mess around). The rest of the time, we were walking across moorland, through snow fields, in dried river beds, or up Barranco Wall. Several times, I thought to myself this just isn't safe. It would be raining, slippery, and I would be crawling over rocks with a heavy rucksack on. Luckily, our guides knew precisely where to step and helped us along if we needed a hand (which I sometimes did as I have short legs). The porters, who carried 15kg of our stuff, plus their our supplies, are amazingly fit. They would pack up after we left, walk by us (I would say casually only in that they made it look easy), and have camp set up by the time we arrived. It took a team of 24 people (guides, cooks, porters, bathroom dude) to support the six of us. We were lucky enough to have three women on our crew. I will post more about the kit I used, my tips for success, visas, and travel insurance (and probably put it all into an e-book) in future posts. But aside from climbing Kilimanjaro, as part of the International Women's Day tour, we also spent a day in Moshi. Initially, I wasn't going to do any fundraising for this trip. However, on our last day in Moshi, we visited two primary schools and a Masai village before heading to Chemka Hot Springs for lunch and a swim. The second school we visited, Rundugai Primary School (photos come soon! ), really connected with me as they had students there with Down Syndrome, among other special needs (if you are new to the blog, I had a nephew with Down Syndrome who was stillborn. In the past, I have done a lot of fundraising for orphans with Down Syndrome). The school doesn't have running water or electricity and was built in the 1960s. Our tour costs included a donation of 10 cement bags to the school, who are in the middle of building toilets for the students and staff. We met many of the children, who came in on a Saturday just for our visit. We also were able to speak with the head teacher, via a translator, to discuss the challenges of the education system. The government cannot afford to pay teachers so this school has 12 teachers for over 600 students, and one of them is in the special needs classroom. There were several classrooms, a community garden, and a large dirt lot for playing outside. We shared our very basic Swahili with the kids and they seemed to enjoy giving us high fives and then ran away, giggling. It was obvious how big the difference was from the American education system, where most kids are given an Ipad to use on a daily basis. The head teacher at Rundugari doesn't have an email address because no one has a computer. Let me repeat that- no one has a computer. You know why? Because there isn't any electricity. It made me realize how lucky I am and my nephews are. But not having a computer isn't the end of the world. What did strike me is that the special needs classroom doesn't have any desks or chairs for their 12 students. The kids were sitting on the floor when we stopped by, playing with large Legos. I spoke to the special education teacher who explained the kids are at different levels, but she works with them in small groups. The children are allowed to study at the centre until they are 25 years old (most kids leave school when 13-16 years old), at which point they get a job if they are able or go back and live with their families. There are not many facilities like this in the Moshi area. I felt lucky we could visit and meet these smiley kids. This visit really inspired me to help these kids out. 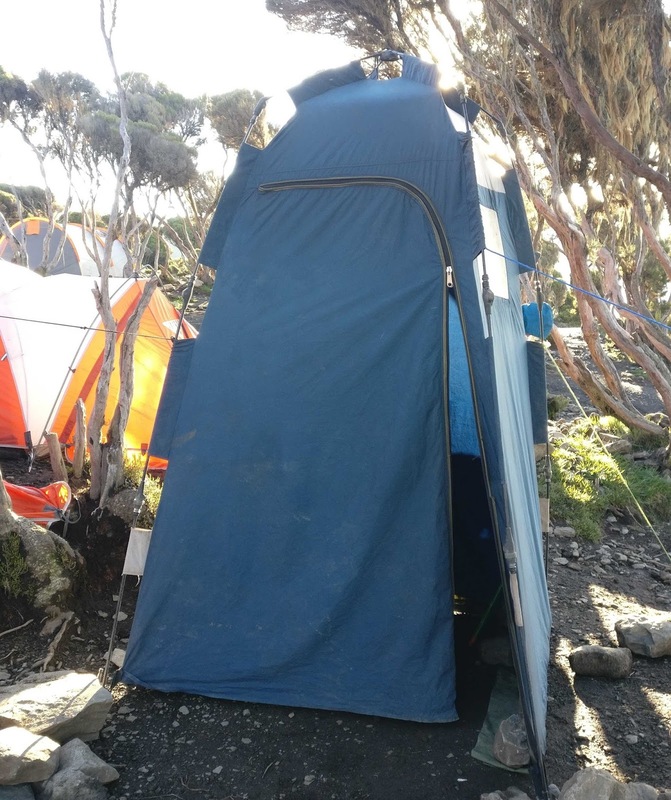 I am pledging to raise £420 (£1 for every kilometer to the top of Mount Kilimanjaro) towards the purchase of 12 sets of desks and chairs for the special needs classroom. If you would like to contribute, (approximately $135 or £95 for one desk and chair set. The head teacher estimated $1600-1800 for the children and teacher set ups), please use the button below. This is my main focus, but below there are also two other ways to get involved. Contribute towards 12 sets of desks and chairs for the special needs students (approximately $135 or £95 for one desk and chair set). All amounts appreciated. The primary school could also use some footballs (soccer balls) for the kids to play with during recess. A leather football costs approximately $25 (£18). Contribute towards the purchase of sporting equipment that all the kids can use here. All amounts appreciated. We also had a candid chat with a local group of Maasai women. They live quite a ways from the local community, in huts that also do not have electricity or running water. The hut fits a mud bed where five people sleep on animal skins and small fire in the corner. The men are off grazing their animals for months at a time and will call their wives once in a while. The Masai women have to walk several miles a week to charge their mobile (cell) phones at the local community centre. I left my solar charging power bank (that will store power for later use) for the women to use, which cost about £20 ($29). Maasai women with my charger. 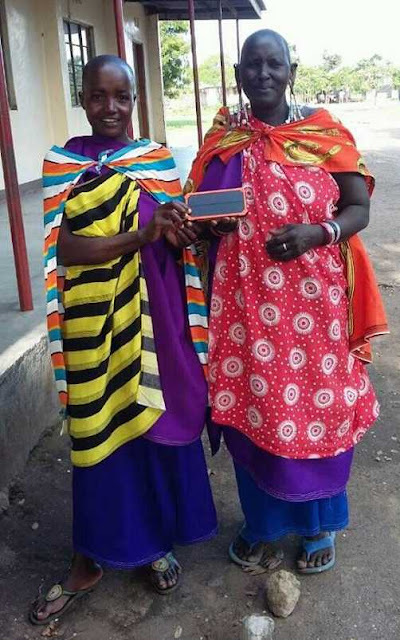 If you would like to contribute towards buying solar chargers for the Maasai women, donate here. All amounts appreciated. If you would rather send items from Amazon than donate cash, see my wishlist here where I have made a few selections that I think the community would appreciate. But feel free to send other sporting goods that will fit into a small suitcase. A fellow Adventurous woman is headed to Kili in August and I will send her with an extra suitcase full of supplies for the children and women. I will update totals on the post every few weeks, so keep checking back to see how we are getting on. If you have any questions about this, feel free to email me: mollie@ptmollie.com. So that is a brief recap of my trip. If there are any specific questions, you have leave a comment below. As I mentioned, I will be adding more posts about different aspects of the trip, so keep checking back over the next few weeks for new posts.